This is decorative flexible brass stripping for use in lampshade work as well as boxes, lanterns, trays and other projects where a decorative edging is required. 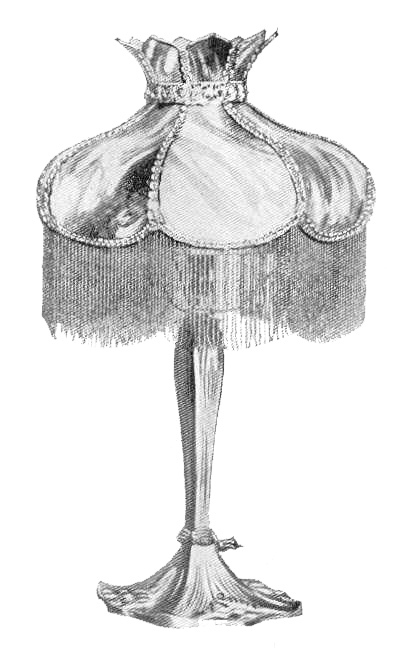 The wider ones may be cut and used as collars at the top of lampshades to hide the joint between the shade and the crown. Easy to solder, too. Most are sold by the foot, and shipped coiled, except #8206 and #8207 which are 90 degree angle corner edge moldings and are sent flat. This lampshade demonstrates the use of brass banding or "gallery" to hide the seams between the curved glass panels. The edges of the panels are wrapped in brass channel. The bottom brass trim is perforated to receive the wire that holds the beaded fringe in place. The brass collar holds the crown together. This lampshade was part of the furnishings of the Royal Bordello of Crown Prince Wilhelm Von Austerhazy of Bavaria, before World War I.
Degrease product – This brass banding coated with an oil-based lubricant as part of the manufacturing process. This oil-based lubricant must be removed before any finishing or paint is applied to the decorative item. Wipe items down using a clean cloth and turpentine, denatured alcohol, strong detergent solution, or a lacquer thinner. Metal Primer – After degreasing the item, it is strongly recommended that you then apply an oil-based metal primer or other type of rust and corrosion-inhibiting coating to the item. (Follow your paint supplier’s directions for preparing, priming and top-coating the material chosen). Once cleaned and protected from the elements, items take oil-based paint and powder coating beautifully: paint (Rust-Oleum, powder-coating, baked enamel, gold/silver plating, electroplating, air brush). For a natural color, use a clear laquer or oil-based polyurethane varnish. For a green patina finish, soak items undisturbed in a glass container with equal parts bleach and white vinegar for 24 hours. (Caution! Do not breath the fumes and keep away from children & pets). Let items air dry until the desired level of color is achieved. Daisy pattern, for lamp seams or box decoration. Can be curved into diameters as small as 4 inches. 3/8" wide. Sold by the foot. Perforated so that it can be bent into compound curves to follow the most intricate bends. Shipped coiled. Priced by the foot. Order any quantity. Decorative brass banding for hiding the seam between pieces on panel lamps. Solid brass, 5/16" wide, sold by the foot. Decorative solid brass banding 1-1/4" wide, sold by the foot. Decorative solid brass banding 1-1/2" wide, sold by the foot. Decorative solid brass banding 7/8" wide, sold by the foot. Decorative solid brass banding 5/8" wide, sold by the foot. 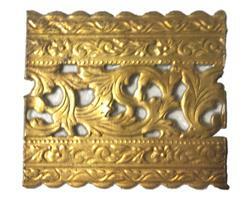 Decorative solid brass banding, 3/4" wide, sold by the foot.